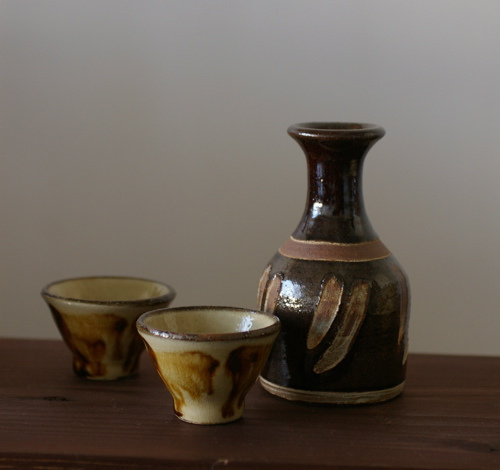 Atsukan is served in a tokkuri, a ceramic flask, and a ochoko, a small cup. The best way to heat sake is on a stove. 1. Pour sake into a ceramic tokkuri up to the neck. 2. 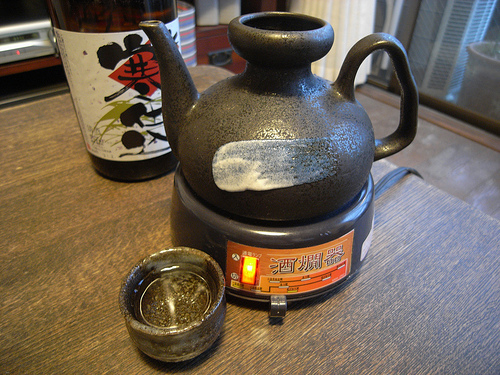 Fill a pot with warm water, and place the tokkuri into the pot. 3. Heat the pot on a stove for 4-5 minutes (don’t heat too much). 4. Take the tokkuri out and serve. You can heat sake in a microwave but it is not recommended because there will be temperature differences on upper and lower parts of tokkuri. For those atsukan lovers, table sake heaters, “shukanki,” are available at supermarkets and electrical stores in Japan. This shukanki is Mino ceramic ware. The temperature is adjustable from “nuru-kan” to “tobikiri-kan”. This is really convenient. You don’t have to leave a table to go to kitchen and heat another tokkuri of sake. Remember, ochoko is not a shot glass, enjoy your sake little by little with tidbits.